Among repeat home buyers, Berkshire Hathaway HomeServices scored 874 out of a possible 1,000 points, performing particularly well in the agent/sales person category among others. “Our Berkshire Hathaway HomeServices network represents top-quality service and representation across the U.S. and in Berlin, London and other parts of the world,” said Gino Blefari, CEO and president of the network. Real estate agents play critical role of guiding customers through process: Among both buyers and sellers, overall satisfaction scores are roughly 100 points higher when agents provide timely responses to questions; keep customers informed of key points in the transaction; and share comparable properties. Strong customer satisfaction builds loyalty and advocacy: Across all customer segments, high levels of overall satisfaction with the firm is directly correlated with likelihood to use the firm again for a future transaction and recommend the firm to others. Reputation matters: A real estate firm’s reputation is the No. 1 or No. 2 reason for selecting a company, across all survey respondents. Social media plays major role: Nearly half (47%) of buyers and 55% of sellers indicate using social media to find agents, with the majority in each case saying they were “delighted” (overall satisfaction of 900 and higher) after doing so. The 2018 Home Buyer/Seller Satisfaction Study includes 4,072 evaluations from 3,332 customers who bought and/or sold a home between March 2017 and April 2018. The study was fielded from March through May 2018. 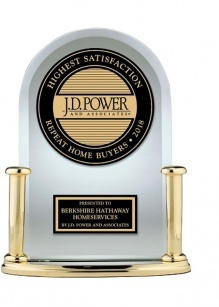 For more information about the 2018 Home Buyer/Seller Satisfaction Study, visit https://www.jdpower.com/business/resource/us-home-buyerseller-satisfaction-study.